As any professional handyperson or experienced DIYer can attest, socket sets are an indispensable extension of the toolbox. They provide the additional heft that simple hand or power tools patently lack and are similarly renowned for their user-friendliness, versatility, remarkable performance, and durability. Practical and functional ones that are equally lightweight and compact and feature an ergonomic design provide for sufficient torque for smoothly and quickly fastening of various bolts and nuts. Besides, in light of the attendant abrasion and possible corrosion, you’re going to want to get yourself a sturdy and durable socket set capable of withstanding attrition even after several years of use. Unfortunately, choosing a suitable socket set for the job is a time-consuming, energy-draining and taxing endeavour, what with having to stay within the confines of your budget while keeping an eye on the most important factors like performance and flawless quality. To help with the exercise, we’ll be thoroughly reviewing ten of the best socket sets on the market to help you decide on the most suitable one for the job and to impart on you the requisite knowledge for making an informed decision on your own. Unlike most brands that are yet to find the right footing, Crescent easily harnesses the industrial-grade construction, usability, practicality, and durability of its flagship socket set, the CTK170CMP2, to provide the user with the best possible performance. 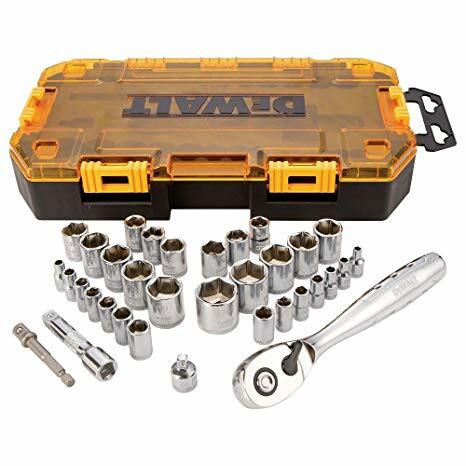 Not only is the package remarkable in all purposes and intent, but it also gives you great value by carefully putting together the essential socket wrenches and other tools to enable you to take on industrial, mechanical, and even domestic projects. You have everything you need in the package including ratchets and a comprehensive assortment of standard and deep sockets. In spite of their sheer number, all the 170 pieces in the storage case are optimized for completing specific tasks, meaning there is something for everyone. You get a comprehensive assortment of SAE and metric-sized standard and deep sockets in addition to 1/4 inch, 3/8 inch, and 1/2 inch ratchets for driving the socket wrenches. With a 72-tooth quick-release ratchet drive in the package, your work is essentially cut out for you and should actually be a walk in the park seeing as all the pieces are user-friendly. The ratchet drive, for instance, firmly and securely holds the fasteners features chamfered ends to prevent rounding and damage. Every nook and cranny of the 170 pieces is designed to provide you with unmatched value and a lifetime of durability. Featuring a durable chrome vanadium steel alloy construction and boasting a superior formulation and heat-treatment, the pieces can easily withstand abuse all day long without the slightest drop in performance or wear and tear. On top of the resultant durability and strength add a chrome finish that provides outstanding resistance to abrasion and corrosion. Additionally, the pieces with handles feature an ergonomic design to enhance ease of use and comfortability. The manufacturer also conveniently provides you with a strong blow mold case for safely keeping all the 170 pieces in between use and to facilitate hassle-free transportation and portability. Users keen on embarking on industrial, mechanical and even domestic projects need to check out the Crescent CTK170CMP2 Set. It comes with a pocket-friendly price tag in spite of its fastidious construction and user-friendliness. The socket set is without a doubt an ideal choice for greenhorns, professional handymen and everyone in between. The Stanley STMT71652 set comes with a comprehensive collection of user-friendly and durable socket wrenches that seamlessly combine high-end construction with affordability. The socket set targets the most seasoned handymen and extreme DIYers who've mastered their way around hand tools. The impressive collection of 123 tools that also include sockets, screwdriver bits, ratchets and a spinner handle means that the socket set is as versatile and time-saving as they come, and will effectively make you an all-rounder. The brand also pulls all the stops to make their socket wrenches user-friendly and comfortable enough so that you can embark on a wide range of projects both domestically and commercially. In the next paragraphs, we'll be deconstructing the socket set to reveal the features and specs that make it stand out in an otherwise crowded field with the cut-throat competition. Like its brother - or sister - above, the set also features top-notch construction quality with the highest quality materials to ensure it provides you with more than a lifetime of seamless and stress-free performance. To this end, all the 123 pieces sport chrome vanadium forged construction which means that compared to other cheap, off-brand models on the market, all the pieces in the set pack more strength and torque and boast outstanding durability. The socket set also features a chrome polish finish that provides superior resistance to rust and corrosion, giving you the freedom of working in a multitude of settings without worrying about any significant wear or tear. All the different tools in the socket set meet or even exceed all industry standard and performance expectations and specifications, including those of ANSI. As a result, the socket set is hugely appealing to users handling the most challenging and demanding tasks. Each purchase entitles you to a limited lifetime warranty that gives you the confidence and peace of mind to work to your full potential. The Stanley brand similarly pulls no punches in ensuring the socket set is both user-friendly and easy to use. First off, all the sockets and drive tools are SAE and metric-sized, meaning that you can effortlessly and quickly switch from automotive repair to renovating the house in a matter of seconds. And because there are various sizes in the set, you can choose the one that’s most suitable to the task at hand, so that you achieve the best results possible. Secondly, the set comes with two ratchets or varying sizes that feature the easy-to-use, thumb-operated reverse switch mechanism, ensuring you work with ease and quickly. The one-handed use design of the socket wrenches means you can use the other hand for equally important and related activities, which again makes it a versatile choice for the seasoned user and greenhorn who wants the best performance. While the case of the socket set is a little rough on the eyes, it nonetheless comes with remarkable practicality and does its job pretty nicely. The case, as you would imagine, keeps all the 123 socket wrenches safe and secure, meaning that it's a useful inclusion for those working in busy industrial settings. The socket wrenches are precision engineered, so you don't experience any hiccups pairing the fasteners and the ratchets together, which in turn minimizes damage. Given the sheer number of socket wrenches in the socket set, distinguishing one from the other might be a little problematic and time-consuming. To make it easy and quick, the manufacturer thoughtfully etches both the size and unit of the socket wrench on its side before neatly arranging them in the case for easy and quick identification, even in dimly lit conditions. For everyday fastening and loosening tasks both around the house and on a commercial site, the STMT71652 set, with all its bells and whistles, provides you with unmatched value. The two ratchets in the set pair nicely with the various socket wrenches to provide with the best performance possible. The socket set is easy to use and is reasonably and justifiably priced. If you need a multipurpose socket set that can handle it all, the socket set comes highly recommended. If you’re growing tired of continuously borrowing socket wrenches from your colleagues to complete a project, or if they’re no longer with theirs, it’s time to get your own. And one of the best socket sets on the market right now is the Tekton 13101 set that comes with a comprehensive collection of 3/8 inch drive tools and drive sizes ranging from 5/16 inch to 3/4 inch and 8 millimeter to 19 millimeter. Plus, the socket wrenches vary in length, with some being shallow and others deep. Also included in the delivery package are a universal joint and 6-inch extension that will quickly prove to be a tall order to find in other socket sets. Continuing on the point above, the socket set is a solid choice for the serious handyman, homeowner, or DIYer who wants it all. Every nook and cranny of the socket set reeks of high-quality construction and exceptional, which is surprising considering that the set features a pocket-friendly price tag. All the 45 socket wrenches in the set feature a high-torque, 6-point design that considerably increases usability and practicality, not to mention extending the lifespan of the pieces. Rather than gripping the corners of fasteners, the socket wrenches grips the flat sides that then prevents any likelihood of rounding off and even wear and tear, as is the case with the vast majority of cheap, run-of-the-mill brands out there. The design of all the 45 socket wrenches also makes for quick and effortless operation. All you need is 5 degrees of swing to tighten and loosen bolts and nuts, meaning that space is never an issue when using the Tekton 13101 3/8-Inch Drive Socket Set. Additionally, the ratchet comes with 72 teeth and is finely geared to deliver the smoothest and most flawless performance, irrespective of the space constraints you’ll be facing. To that add an ergonomic design that increases comfort and ease of use so that your hands won’t suffer any fatigue or strain even when you apply lots of force. The construction of the socket set is a far cry from that of other tools on the market masquerading as socket wrenches. The likelihood of any of the socket wrenches rounding off from the user's application of great force in an attempt at dislodging the toughest bolts and nuts is very remote, which speaks volumes about their quality of construction. All the 45 pieces in the socket set feature industrial-grade construction from premium chrome vanadium steel, meaning that they can easily and gracefully withstand the harshest abuse without a single drop both in performance and durability. While the sturdy and long-lasting construction is the icing on the cake, another feature that stands out is the fact that the tools have a mirror chrome plated finish. That gives you the green light to use the socket wrenches in multiple settings without the risk of them rusting or corroding, even when you work in mostly damp and wet conditions, like a plumber. Aside from the already mentioned slew of upsides, the socket set also comes with a storage case that’s as tough as its compact. It allows you to neatly arrange all the socket wrenches to save on space to guard against the possibility of losing them. It comes with two-piece lids that allow for tight closing of the case so that there is no possibility of it inadvertently opening and losing the components. 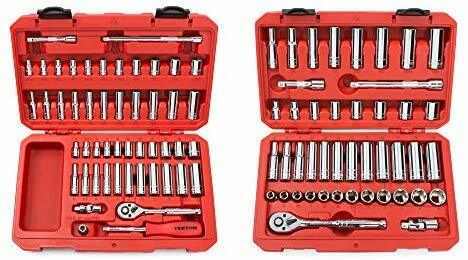 In closing, we’ll once again reiterate that the Tekton set is one of the best socket sets on the market currently. The set comes with a wide selection of commonly used socket wrenches with sizes varying from 5/16 to 3/4 inch and 8 to 19 mm in both shallow and deep lengths. Coupled with the finely geared, 72-tooth ratchet, the socket set easily becomes very effortless to use for various projects and tasks both around the house and on a commercial scale. And the best part is that it comes with a budget-friendly price tag in spite of its exceptional performance. DeWalt is one of those brands that needs little preamble considering that it has become a household name in light of its products’ high-quality construction, ease of use, and longevity. 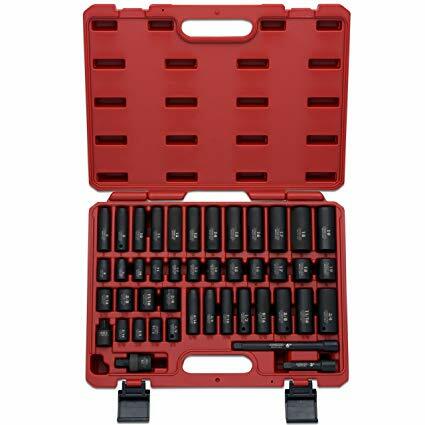 And the brand’s flagship socket set, the DWMT73804 set, comes with a comprehensive assortment of 34 different tools, including socket wrenches and other tools. With the socket set, you have in the palm of your hands all the essential socket wrenches and other related accessories to help you make short and quick work of the toughest projects. Whether it’s fixing something around the house or taking on large commercial projects, the socket set will invariably rise to the occasion. Plus, it packs a bunch of useful and instrumental features to give you the easiest time. Enough with the overview. Now, let’s delve into an in-depth review of the socket set to reveal exactly why it strikes a cordial cord with professionals and enthusiastic DIYers alike. 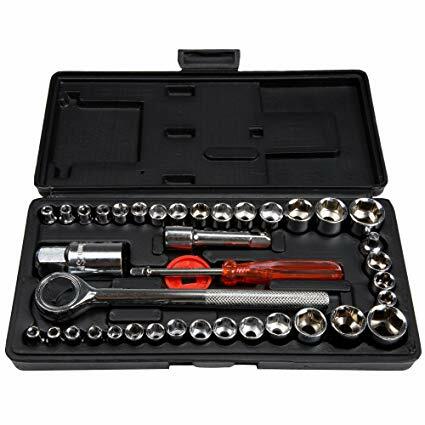 The socket set comes with most, if not all, socket wrenches handymen and extreme DIYers commonly use for home repair and remodeling and automotive repair. All the socket wrenches in the set are either SAE or metric-sized with the former ranging from between 5/32 inches to 7/8 inches and the latter from 5 millimeters to 19 millimetres. Such a careful assortment makes the socket set quite a versatile one for taking on a wide range of projects. The delivery package also comes with a 1/4 inch drive for driving the small metric and SAE socket and another 3/8 inch drive for the large SAE and metric sockets. The ratchet that comes with the DEWALT DWMT73804features a 3/8 inch drive, but there is also a handy drive converter for increased versatility in the workplace. Unless you're a seasoned handyman, knowing which socket wrench to use in a particular situation can be a little daunting, at least at the beginning. However, DeWalt pulls no punches in ensuring using the socket set is a cinch, especially for novices. For one, the user gets a useful and convenient extension for quickly and effortlessly reaching deep holes without straining. In sharp contrast to cheap, weak and flimsy socket wrenches on the market, this model features top-notch construction quality using forged chrome vanadium steel that will easily stand the test of time even with heavy-duty, everyday use on a busy commercial setting. The design of the tools also features the innovative direct torque technology that conveniently transforms little effort on the ratchet or drive to maximum torque at the other end, making for quick and effortless tightening or loosening or the most stubborn nuts and bolts. To the burgeoning slew of advantages add the fact that the direct torque technology also stops any rounding off and therefore considerably extends the lifespan of the socket set. The remarkable engineering of the 34 tools make it a solid choice for professional handymen on the one hand and greenhorns on the other, and everyone else in between. There are several additional features worth bringing to your attention, so let's start with the most pertinent. For one, all the 34 tools and socket wrenches in the set come with a polished chrome vanadium finish to guard against corrosion and rust and obviously, to make them incredibly appealing physically. Secondly, the control ring is knurled to give you a secure, firm, and comfortable grip, leaving no room for slippage in the course of work. Furthermore, the different pieces in the socket set come with hard stamped markings to make it easy for the user to differentiate between one socket wrench and another, making it easy and quick to pick out the piece they need for the job. Like mentioned earlier, the wrench handle features an ergonomic design to enhance comfort and ease of use. Also, there is a secure snap lever that allows for single-hand operation and guarantees a non-slip hold. All the pieces come neatly arranged in a durable lockable stacking case for safely holding the socket wrenches and tools. And since the pieces are lightweight and compact, the case is very portable and takes up minimal storage space, and fits a T in most tool chests. 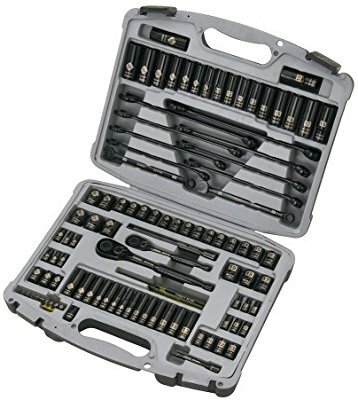 The preference for this set is informed by several key attributes including compactness, portability, affordability and a comprehensive collection of all the vital ratchets and sockets for making your work quick and easy. The ergonomic design of the socket wrenches is forgiving on the hands and greatly enhances usability. Similarly, they can withstand heavy industrial use and resist both rust and corrosion, thanks to the manufacturer’s use of high-end materials. If you want great value at a fraction of the price, consider going with this socket set. For professionals and enthusiastic DIYers with their hearts set on acquiring a functional and practical set of cost-effective, easy-to-use, and long-lasting socket wrenches, we present to you the Sunex 3342 Impact Socket Set. Unlike other brands, Sunex delivers on its promise, providing you with tools that work as intended or advertised. While it may be a lesser known brand compared to DeWalt and Tekton, Sunex’s products easily hold a candle to those of more established brands. The package, for instance, comes with a plethora of tools ideal for handling a wide range of projects, both domestically and commercially. And they're all professionally designed to give the user the best experience, irrespective of the project they intend to handle. All the socket wrenches in the socket set reek of high-quality construction, and that’s by no way fortuitous. The seamless performance of the socket wrenches is entirely attributable to the manufacturer’s use of chromium-molybdenum alloy steel for the construction of the socket set. The material ensures the pieces provide you with several years of flawless and smooth service for more than a lifetime. Even when the socket wrenches start nearing the tail end of their useful life from several years of heavy-duty use, their performance will still overshadow that of other weak and flimsy variants on the market. The material easily stands up to high impact, making the socket set the go-to tool for professional handymen, craftsmen, contractors, plumbers, mechanics and even experienced DIYers. The strength and durability of the socket set are, for all intent and purposes, legendary. The Sunex set has all the essential socket wrenches and other tools you need to power quickly and with minimal effort through a wide variety of projects. The pieces sport a game-changing radius corner design that guarantees increased torque, meaning that you don't need a Hulk-like physique to use any of the pieces. The set comes with a total of 42 pieces, all meticulously designed and engineered to provide you with the ultimate performance without leaving a huge hole in your pockets. The package includes shallow and deep sockets and a universal joint; just about everything you need to complete your projects without any hiccups. The shallow sockets are a perfect choice for undertaking low clearance projects and are handy for diagnosing and repairing automotive engines. The design and engineering of deep sockets, on the other hand, makes them ideal for installing and removing lug nuts. 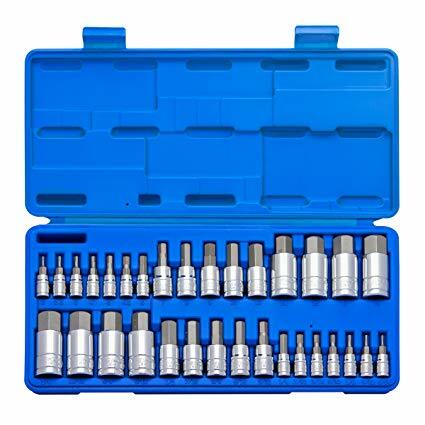 Because of depth, they’re capable of extending further onto the lug nut, grabbing it securely for quick and effortless removal or installation. The fact that it comes with an exclusive Sunex lifetime warranty shows just how confident the brand is in the construction quality and performance of their product. That’s enough to give you the confidence you need to make a purchase, with the assurance that the warranty covers you against all deficiencies in material and manufacturing. Considering the fastidious construction of the socket set, though, we doubt if you’ll ever have to use the warranty. The Sunex brand does not expect you to carry all the 42 pieces in your hands unless of course, you have more than a pair. Instead, it provides the user with a lightweight, compact, highly portable, and heavy-duty blow molded storage case for safely keeping all the different socket wrenches and other tools in between uses. The clear and conspicuous marking of all the 42 different pieces aims at enabling you to identify a particular with ease: you don't have to strain your eyes to see the etched markings. Any professional automotive technician or enthusiastic DIYer with a keen eye for cost-effective and high-performance tools surely can't miss the Sunex set. The brand's name might not immediately resonate with the user but its product rival those of well-known brands in performance, durability, ease of use, and versatility. Aside from the metric and deep metric sockets with sizes lying between 10 millimetres and 19 millimetres each, and SAE and deep SAE socket also ranging between 5/16 inch and 3/4 inch, you also get an additional 3-inch extension handle to enable you to reach tight, hard-to-reach spots with ease and speed. Years from now, you'll be glad you decided to go with the socket set. The Neiko 10288A set packs a host of instrumental features under its belt and is a solid choice for virtually all professionals, hobbyists, weekend warriors and extreme DIYers out there in search of a socket set. If it’s not the heavy-duty construction that you’ll find appealing, then the durability, versatility or pocket-friendliness of the set will do the trick. With 32 tools and socket wrenches packaged neatly and beautifully in the heavy-duty case, there isn’t a single project you’ll hesitate before undertaking. Another feature that draws professionals and greenhorns to the socket set has got to be the ease of use. The design and engineering of the socket wrenches and tools aim to take the time and effort away from tightening and loosening all types of bolts and nuts, both shallow and deep. And in that endeavor, the socket set more than shines. Like the high-end socket set that it is, the socket set features an outstanding construction quality, which it seamlessly combines with performance and ease of use to provide the user with the best possible performance. 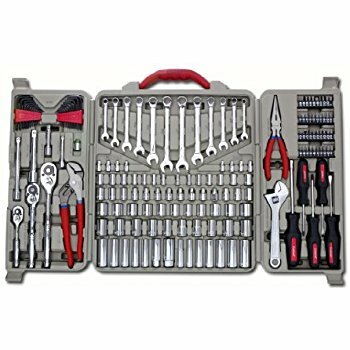 All the 32 pieces of tools and socket wrench in the set feature an all-premium S2 alloy steel construction. Steel has a reputation for being an ultra-durable and ultra-strong material that will stand up to many years of abuse, unlike some of the materials some manufacturer resort to in an attempt to keep costs down. However tough your nuts and bolts are, the 10288A set is more than rugged to handle them with minimal resistance or wear and tear. Plus, you get a comprehensive collection of both hex bits and hex sockets, so you'll be powering effortlessly through the toughest projects without breaking a sweat. The first 16 metric pairs come in sizes ranging from 2 mm to 19 mm while the sizes of the remaining 16 SAE pairs range from a minimum of 5/64 inches to a maximum of 3/4 inches. And all the pieces are drivable by 1/4, 3/8, and 1/2 inch ratchets. You'll, however, have to buy the ratchets separately as they don't come with the delivery package. Still on the topic of construction, the sockets offer the user incredible torque that enables the user to tighten or loosen bolts and nuts with minimal effort and quickly. To this add an industrial-strength chrome vanadium steel construction of the socket and a mirror chrome finish that both increases the attractiveness of the pieces and increases resistance to rust and corrosion. Consequently, the socket set will maintain its cutting-edge performance and appealing looks for several years into the future whether you'll be using the machine on heavy, industrial projects or light-duty domestic tasks. Like DeWalt and Tekton, the socket set fits together with the ratchet to a T, leaving no room for slippage and errors while working. The precision and automatic machining of the tips of the bits ensure accuracy in size. Additionally, they end up with smooth ends that pair nicely and flawlessly with fasteners, ensuring no damage occurs to the bits or fasteners even when the user applies tremendous amounts of force. The ergonomic design of the socket set also mean you don’t have to worry about hand strain or fatigue. And because the 32 pieces are both lightweight and compact, they take up minimal space in the provided storage case, which is subsequently light and highly portable. If you’re serious about being a productive professional or hobbyist, and we’ll go out on a limb and say you are seeing as you’re reading this, you want nothing but the best performance. The set is a high-performance and very durable socket set that will invariably rise to the occasion when the situation demands it. For its price, you get a durable collection of industrial-grade bits and sockets that are highly resistant to corrosion and with chamfered heads for that smooth and trouble-free performance. At its price, we can confidently vouch for it. 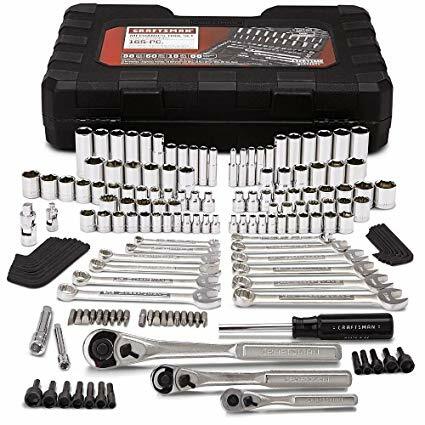 For the mechanics looking for an all-around socket set to use hassle-free in various settings including homes, the garage, and the work site, check out the Craftsman 38165 165 set. Even with its wide range of socket wrenches, a ratchet, two extension bars and two universal joints, the socket set is remarkably pocket-friendly and will go a long way in assisting you to complete the most demanding tasks quickly and efficiently. Whether you want to assemble a new grill, put a bicycle together, or diagnose and repair the automobile, the socket set will always come in handy. However, the fact that the socket set comes from China should not be construed to mean a sacrifice in quality, as is the common misconception, especially in the West. With the pleasantries out of the way, now let's get started. Craftsman, like DeWalt, Stanley, and Neiko, among other brands, makes products that are synonymous with high-quality production, industry-best performance, and incredible ease of use. And the brand's flagship product, the socket set, is no exception. All the socket wrenches and other tools in the package feature high-quality construction using forged industrial-grade chrome vanadium steel. The first implication of outstanding construction quality is that the socket boasts remarkable strength and durability and will provide you with hassle-free performance provided you use the appropriate amount of force and stay on top of maintenance, not that there’s going to be any. All the 165 pieces also feature a chrome finish which, as you would guess, aim at keeping rust and corrosion at bay, meaning that the pieces will invariably maintain their sophisticated, modern looks. As for versatility, the 38165 set packs a wide array of different tools, including 92 standard and deep sockets of varying sizes. And since the different pieces are either SAE or metric-sized, you can comfortably and confidently drive them using a 1/4 inch, 3/8 inch, and a 1/2 inch drive ratchet. The package also conveniently includes two universal joints to allow you wrench from multiple positions without straining. It’s also for this reason that you get two extension bars; to give the user a deeper reach so they can fasten different nuts and bolts with ease and speed. There are also nut driver bits, screwdriver bits, a driver handle, and some hex keys to help with other onerous fastening tasks. Mechanics, carpenters, handymen, contractors and even enthusiastic hobbyists and DIYers who frequently handle a wide range of light-duty to heavy-duty applications need a sturdy, versatile and practical set of ratchets, drivers, and socket wrenches. Your best bet would be the Craftsman set. The socket set provides the user with good value for their money. The beauty of Bostitch is that it has a knack for perfectly balancing power, practicality, versatility, and affordability in a way other brands just can't quite emulate yet. The ingenious design of its products aims to give you a quick but flawless performance so that tightening and loosening nuts and bolts isn't as onerous as it is with cheap, flimsy models on the market. 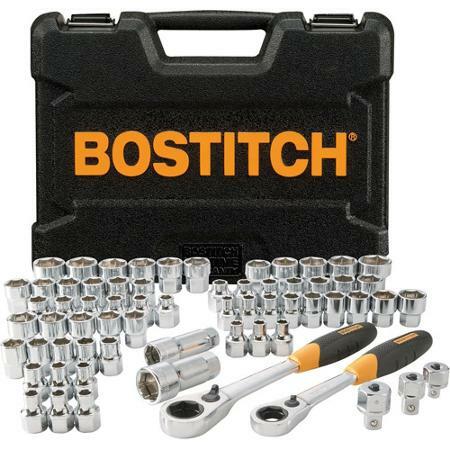 And now, we introduce you to one of their best socket sets, the Bostitch BTMT72287 that effectively ushers you into a new world of effortless and effective tightening and loosening of nuts and bolts. The socket set joins the long list of socket sets made from the sturdy and durable chrome vanadium steel. Couple that with the inclusion of a heavy-duty ratchet boasting 72 teeth and you have yourself a system that provides for hassle-free performance all year round. The ratchet also fits nicely and comfortably with the socket wrenches and leaves no space for errors like slippage in the course of your work. As impressive as that sounds, it’s easily overshadowed by the pieces’ pass-through design that, unlike deep sockets, gives user unhindered quick and hassle-free reach to fasteners. The chrome finish of the pieces ensures resistance against rust and corrosion that would otherwise considerably reduce the lifespan of the socket wrenches and ratchets. The high-quality finish similarly makes it easy for the user to differentiate among the different pieces considering the dark background of the storage case. And if you still can’t tell the difference between the different parts, the manufacturer has stamped size markings on all the pieces to make it easier and quicker. The two ratchets in the set also sport soft, rubberized grips so they’re comfortable in the hand and to eliminate the possibility of slippage while working or of the pieces straining your hands or causing hand fatigue. The BTMT72287 set has all the different tools and socket wrenches you need to complete various projects both around the house and on the job site. The 65 pieces in the set ensure incredible versatility, and since they are all conspicuously marked, you get to switch from one task to another with ease and speed. The set might be rough on the eyes, but when it comes to performance, it’s without a doubt the king of the playground. Its unique design translates to 15 percent more torque and ensures you finish your projects quickly and conveniently. It’s an ideal choice for the value-conscious user who wants more out of their tools. If its high-performance, versatility, ease of use, and durability you’re looking for, let’s introduce you to a high-end socket set that packs the best of all worlds: the EPAuto 40-Piece Drive Socket with Reversible Ratchet. The socket set performs in underwhelming fashion, enabling you to tighten and loosen variously sized nuts and bolts with remarkable ease and speed. Plus, using it is a cinch, and it comes with a pocket-friendly price tag, which explains why it's an all-time favourite of craftsmen, handymen, electricians, mechanics, carpenters and even extreme hobbyists and DIYers all around the world. Normally, it takes great effort and lots of time to assemble and disassemble complex systems like automotive engines and other types of machinery. However, with the socket set in your toolbox, a once nerve-wreaking and exhausting endeavour quickly transforms to a quick and relatively effortless one. In addition to providing the user with large sockets, the delivery package similarly includes a reversible ratchet that boasts an innovative flank drive design for smooth and flawless performance. Together, the performance features of this set make short and quick work of the toughest applications, be it around the house, in the garage, or the construction site. Additionally, the ratchet has a set of high-quality teeth that provide for a smooth and efficient performance devoid of the struggles and gnashing of teeth and straining of the hands that occasion using weak, humdrum variants on the market. The ratchet fits to a T around the fasteners, leaving little to no room for slippage and rounding off in case you apply excessive force to dislodge particularly tough nuts and bolts. Plus, you have at your disposal 40 different but commonly used socket wrenches and a sturdy 3/8 inch ratchet that come handy for domestic and commercial use, whichever applies in your situation. The use of metal chrome vanadium steel alloy for the construction of the socket set and the skill and expertise of the brand’s engineers guarantees you several years of service. The 40 pieces, with their easy-to-see markings on the sides for easy identification, ensure versatility, enabling you to take on a range of projects without the slightest hesitation. Also, you get a heavy-duty storage case for keeping the ratchet and pieces for easy storage and transportation. The simplicity, durability and flawless performance of the set is hard to find with other socket sets. It’s a versatile choice that’s handy for automotive and bicycle repair, among other applications. Plus, it comes at a fraction of the price of other high-end alternatives even though the difference in performance is trivial. 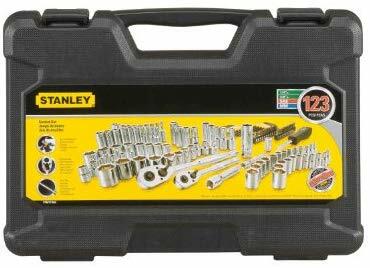 There is a sea of socket wrenches between bare-bones entry-level and professional grade models that may be just up your alley, but only a handful combines affordability and performance like the Stanley 92-839 set does. The socket set is a significant step up from the basic ones you'll find on the market, and it goes a long way in making your work relatively more effortless, quick and efficient. The manufacturer pulls all the stops to make the socket set one of the best you can find without breaking the bank, and this's easily reflected in the pricing. For seasoned handymen in search of nothing short of the best performance, the socket set comes highly recommended. A comprehensive review of the socket set follows in the subsequent paragraphs. One of the most striking features of the socket set is the construction quality. The use of black chrome, laser etched vanadium steel for the construction of the socket wrench means it can easily undertake the largest and most demanding projects both around the house and on the job site. The high-end construction quality means strength and longevity are never a problem with the socket set. Consequently, it is hardly surprising that the socket set meets or exceeds all ANSI standards for ratchets and sockets. The brand leaves nothing to chance. In addition to the high-quality construction, all the 99 pieces in the set feature metric and inch sizing to guarantee project versatility. The black chrome finish of the set also gives you a sophisticated and sharp look that makes the pieces stand out. To this add superior slip and corrosion resistance and you have yourself a socket set you'll be using for comfortably and confidently for several years to come. As mentioned earlier, the set comes with 99 pieces. The six-point and eight-point socket minimize fastener and likelihood of slippage, making for safe and precise working no matter the scale of the project. Tightening and loosening bolts will never be as easy and quick as is it with the socket set. All the 99 pieces in the socket set feature a design that guarantees the user high torque, making for quick and effortless tightening and bolts. All the socket wrenches are similarly compact and lightweight, which couples nicely with the fact that the ratchet arm works on a low 7-degree arc that in turn keep hand fatigue and strain at bay. All the wrenches are similarly ergonomically designed so that the likelihood of developing blisters all over your hands after several hours on the job are remote, at best. Additionally, all the 99 pieces arrive in a 2-piece case in which they are neatly arranged to make it easy, even for greenhorns, to quickly differentiate between the different pieces. And in off-chance you can't tell one wrench from another, all the wrenches also come with highly visible etched markings on the sides. The days of fashioning you backpack to double up as a tool bag are long gone, and so is the likelihood of misplacing any of the pieces, which is welcome news for handymen, contractors, and even DIYers working in busy settings. The 92-839 set is clearly a high-end socket that's a far cry from the cheap, weak, and flimsy tools on the market masquerading as socket wrenches. It's design and construction, and ease of use make it the go-to tool for seasoned handymen and greenhorns alike who want nothing short of the very best performance. If you want value for your money - and we're guessing you do cause otherwise you would not be reading this – consider going with this socket set. SAE and metric-sized sockets come in three different drive sizes which are 1/4-inch, 3/8-inch and 1/2-inch each of which is compatible with different sets of ratchets and accessories. Compact sockets pair nicely with equally small drives while large sockets are going to need large drive sizes. The mid-placed 3/8 inch drive is suitable for working with most sockets in the set if they come in a one drive size. Smaller sockets give the user easy, quick and unhindered access to smaller fasteners in hard-to-reach places while their larger counterparts are suitable for loosening or tightening large fasteners. Most socket sets come with a carefully assorted collection of both shallow and deep sockets and depending on the type of project you want to undertake, you may need more of one type than the other. Deep sockets give you the extra reach that shallow ones lack. When your shallow sockets can’t touch the nut, it’s time to pull out the deep sockets that easily reach and engage the long end of the fastener before comfortably and flawlessly tightening or loosening it. You need to decide beforehand whether you’ll be using impact or manual wrenches for your projects. Impact wrenches pair nicely with impact sockets to provide you with superior performance. Pairing an impact wrench with a manual socket is, however, a bad idea as it does not have the requisite tough construction. Tightening and loosening bolts and nuts is no mean feat, but with the right socket set, it should be a hassle-free endeavour. Both mid-range and high-end variants pack several convenience features to take the time and effort away from the toughest and most demanding applications. Some, for instance, have ratchet extensions for extending the reach of the ratchet, giving the user easy access to hard-to-reach and awkward spots. Also, others are lightweight and compact and feature soft, rubberized handle grips to prevent hand fatigue or strain. If you move around a lot, you may also want a socket set that both lightweight and compact and with a heavy-duty carrying case to facilitate portability. Similarly, the socket should be versatile by packing most, if not all, of the pieces you’ll be using frequently. The last but equally important consideration when shopping for socket sets is the quality of construction. Like all power and hand tools, socket sets lose their effectiveness and performance as they approach the tail end of their useful life. To minimize wear and tear and to ensure you get the most out of your purchase, it would be prudent to go for one that features high-end construction using industrial-grade materials. Other facets of construction quality you want to pay attention to include precision, the design of the grips of the handles, and weight. Q: How many sizes of ratchet and socket drives are there? A: You have a choice of three sizes starting from 3/8 inches, 1/4 inches and lastly 1/2 inches. In the off chance that these do not get the job done, you can always use converters to get the right size you want. Q: Different manufacturers use different materials to make socket sets. Of the most commonly used, which would you recommend? A: Tightening and loosening sometimes frozen and rusted nuts and bolts require the user to have a socket set made from the highest quality materials. To this end, manufacturers tend to choose between steel, chrome vanadium, while high-end socket sets even feature chrome vanadium steel. Of course, the stronger the material, the more expensive will be socket set. A value-conscious user will settle for nothing less than the absolute best, and our list features ten of the best socket sets on the market currently. It has something for everyone. Enthusiastic DIYers, hobbyists, and even professionals are sure to find a socket set that best meets the demands and requirements of their projects. The socket sets are long-lasting, easy to use, affordable, and best of all, pack a great deal of value.